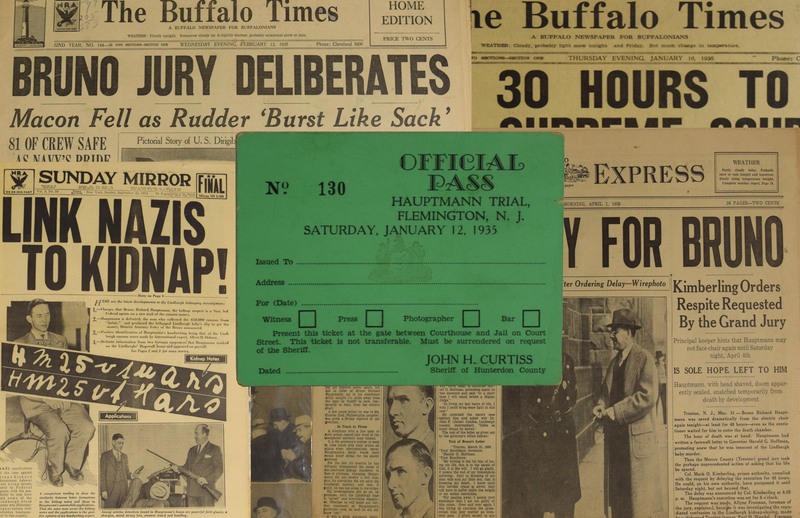 Bruno Richard Hauptmann rare unused trial pass and 12 related newspapers of the time.Bruno Richard Hauptmann Collection with a rare unused trial pass and 12 related newspapers of the time with Headlines referring to the Trial and outcome. 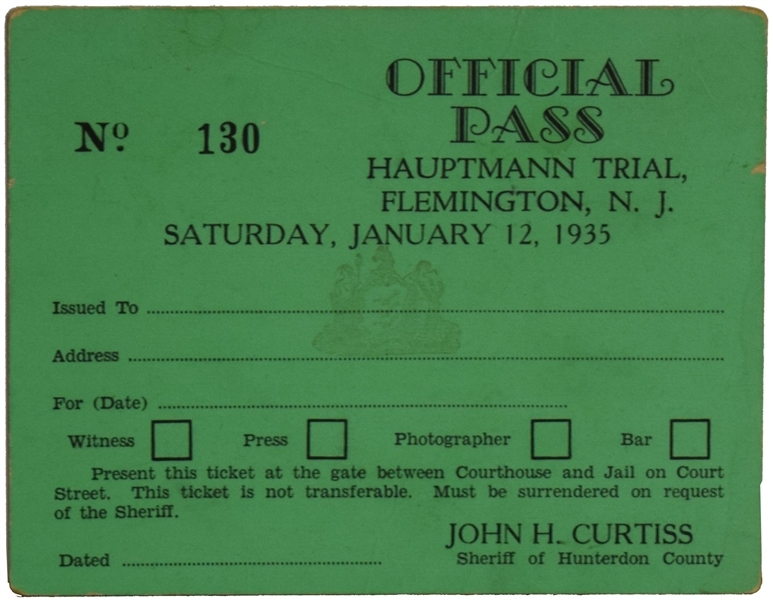 This official Pass to the Bruno Hauptmann Trial, Lindbergh Baby Kidnapper. One page, 4.25" x 3.5", Flemington, New Jersey, January 12, 1935. This is ticket #130, Official Pass, for the trial of Hauptmann. Bruno Hauptmann had been arrested on September 19, 1934, for the crime of kidnapping Charles A. Lindbergh Jr. from the Lindbergh home in Hopewell, New Jersey. 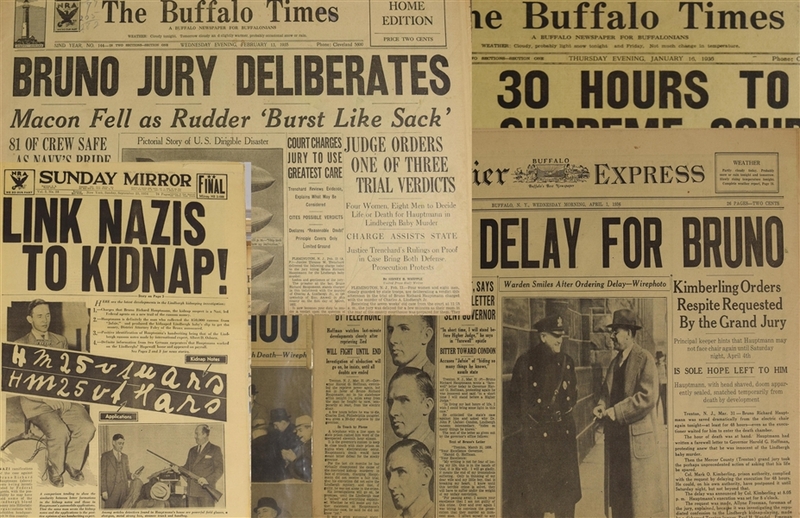 Hauptmann's trial was front-page news from its start on January 2, 1935 until his conviction on February 14th. Seats in the courtroom were in such demand that the judge had to chastise the attorneys for both sides for issuing subpoenas ostensibly to "witnesses" who, in reality, were friends hoping to get a seat to view the proceedings! Despite New Jersey Governor Hoffman's doubts about his guilt and pleas for clemency, Hauptmann was executed in the electric chair on April 3, 1936. Passes like this one are rarely blank and in such fine condition; this example has not been filled out and displays with very little wear. In very fine condition.